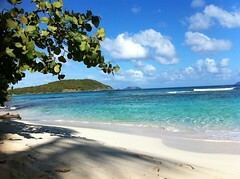 Coming to you live from Hawksnest Beach, St. John. I get to work at the UVI St. John Academic Center today so I came over early to see a little of the island before heading to work. So I decided to just hang out at hawksnest for a bit and do a little reading. There was a yoga class going on when I first pulled up. Wish I had known that, I may have came earlier so I could join in. Well this week was pretty quiet. No guests, so we're trying to get back into the routine. I started back on Jenny Craig, Zumba, willPower & Grace, the whole shebang. The last couple months of holidays and guests haven't been kind to my weight goal so I'm trying to jump start back into some kind of routine. It's only for a couple weeks though because we have more friends arriving next weekend. One group on St. John, one on Water Island and one with us. After that there are no more guests scheduled so I'm really going to kick it in high gear. Jay has been super busy at work but we may get to run over to Joes Beach bar Sunday afternoon.